Progress on decorating the once-empty family room has sped up in recent weeks. After much internal (and external) debate on ottomans and throw pillows I feel like the room is finally starting to take shape. Sure, I'd like a smaller swivel chair close to the fireplace (I'm thinking something with a skirt to counteract all the leggy pieces in the room already), curtains and dramatic built-ins on either side of the fireplace, but I feel like I'm finally starting to get somewhere with this room. The biggest deviation from my original design (shown above) has definitely been the decision to go with a coffee table in lieu of an ottoman. Dave had initially wanted an ottoman for comfort's sake (he loves nothing more than a spot to put his feet up), but I had a lot of trouble finding an ottoman that I liked and that didn't feel too heavy or large for this rather narrow space. 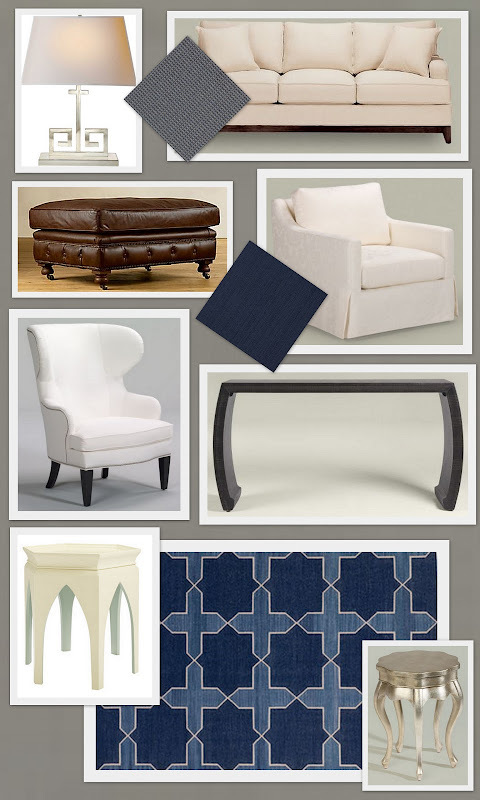 You probably don't want to know the amount of time I spent (okay, wasted) scouring my favorite online sources for ottomans or coffee tables that fit the bill. After all but giving up, the perfect coffee table managed to find me, on super sale at One King's Lane (which is increasingly becoming my go-to resource for decorating my new home). I need to get a piece of glass cut for the top (the table even came with a handy template I can take in to the glass cutter's! ), but otherwise I'm loving it as its longer length and narrower width fits the space perfectly. As the name suggests, the Raj cocktail table has an Anglo-Indian flair with its woven top, java finish, turned legs, and I think the British Colonial style plays nicely with the chinoiserie style of the other tables in the room (the silver leaf five-leg table and the collector's classics console table, both from Ethan Allen) without making the room feel either too eclectic or too theme-y. 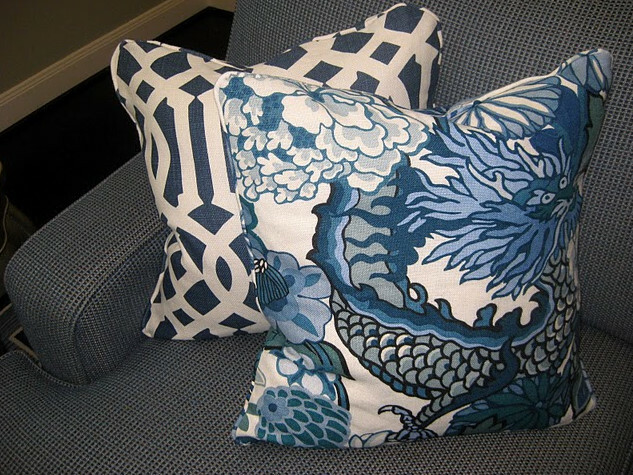 And of course I can't resist a close-up of these gorgeous throw pillows (see HERE for the first half of the story). 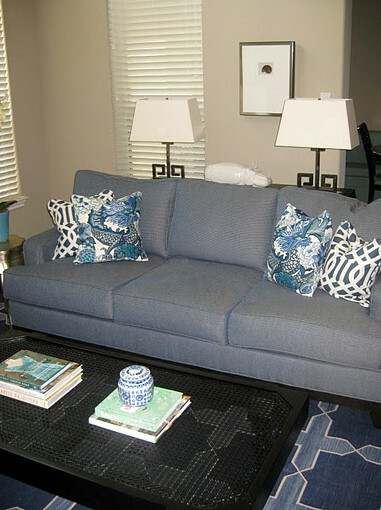 The three pillows I had made out of KWID's Imperial Trellis II really pull the room together for me -- the trellis pattern is the perfect compliment to the Chiang Mai fabric on the other pillows and the Madelaine Weinrib rug. I must thank Melanie over at Plum Cushion for making them so beautifully (and quickly!) and for even sending me back all my leftover fabric. If you're looking to get some custom pillows made, I can't recommend Melanie enough. I didn't have a lot of time to really style the room, but I added a few of my favorite design books and candles to the coffee table to make it a little less stark. I also added the white orchid that Dave bought me after I returned from a business trip to the side table (it was living in our master bath). As a final touch, I pulled out my Jonathan Adler hippo (scored last year off eBay), which had been sitting in our pantry since our move last August, awaiting his new home. Doesn't he look darling behind the sofa? Osborne & Little's Summer Palace! Many thanks to Susie of Maddie G Designs for hooking me up with this wallpaper; it's even more fantastic in person. If you're not a design professional but are interested in getting direct access to trade-only products, Susie is a wonderful resource. Not only did she help me locate the product(s) and get a good price, but she was responsive and easy to work with as well. Thanks, Susie! Now the only task is to find someone to hang this for me -- anyone have any recommendations for good wallpaper hangers in Houston? Great progress! I really like the rug. Where is it from? 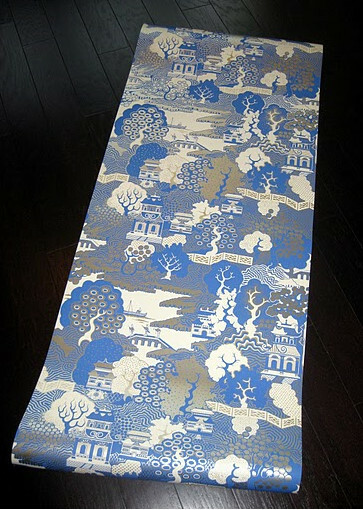 The rug is by Madeline Weinrib and is available at ABC Carpet & Home. If you don't have one near you (as I don't), you can always contact MW through the website and they'll send you a price list and take your order over the phone. Shipping was totally reasonable and I got the rug within a few days! Of course, you run the risk of colors not working, etc. but since I got the rug first, I figured I could just coordinate the rest of the fabrics with it. You & Dave must be so proud of your family room and all your abilities for creating a gorgeous space to call home? You most certainly have the eye Averill and it's been quite fun to follow the transformation. I love your new 'summer palace' wallpaper, it's going to look terrific. I only wish I new of a good wallpaper hanger locally for you. Whoever did our home 30+ years ago did a fabulous job as it will NOT come off. Unfortunately I've been the paper-hanger for our home & I would not recommend me to anyone. Wishing you a good Wed.! Just gorgeous Averill. I love it all - and loved seeing the progression through the photo flashbacks! 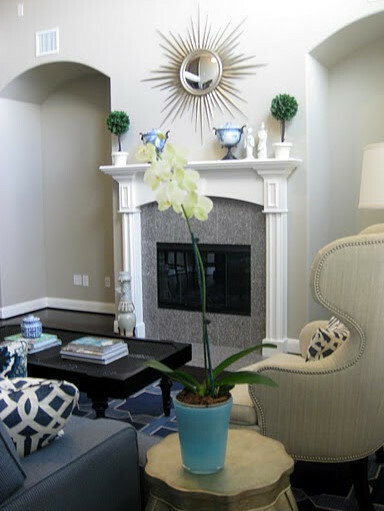 I think it looks like it belongs in a magazine - especially the fireplace mantel and the console table behind that sofa. Oh, and the throw pillows - LOVE them. Is that rug soft and plush? Or a cotton weave? It's so pretty, and you know how I love blue too! I enjoyed seeing the photos at each stage of the process. 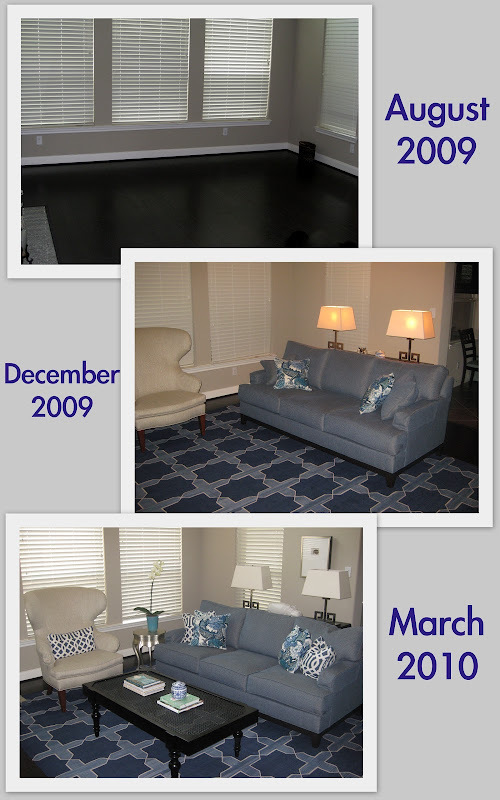 I love instant gratification but the reality is it takes time to pull a room together and what you did is fabulous. And I do love the table lamps you selected. Maddie G is quite resourceful. I love all the links she has on her website too. Enjoy your new family room! you have been busy! looks so pretty, I know you must just be in love with the results so far. Also curious about your approach for the windows. All the windows in my house have the same blinds and I'm not a huge fan of the look in every room. Love the mix of fabrics and the starburst mirror! Great wallpaper, too! I love your room and I can't wait to see what you do with the wallpaper. I just did a post on toparies and yours are so pretty. 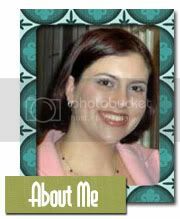 I'm just curious - do you have plans for your niches? Re: wallpaper hangers--ask Lisa. I'm sure she has references. Another source is Chambers Paint--they have given me good referrals in the past. Averill, I really enjoy the coffee table! That Dave is so sweet -- the orchid is a perfect, nice touch to the room. averill, this is gorgeous! 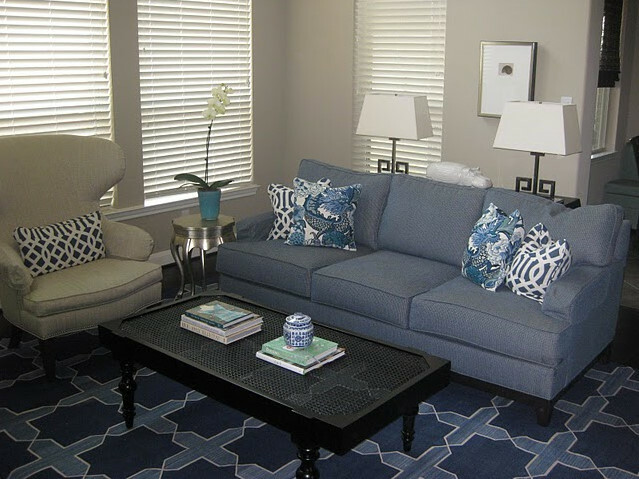 the madeline weinrib rug is amazing and the fabrics you chose for your throw pillows are the perfect complement. i love the sunburst mirror, the hippo, and the wingback chair... essentially i love everything about it! it's definitely come a long way in a relatively short time frame. congrats! where is the moroccan-inspired white table from your inspiration board from? Poindexter: I would like to put some simple curtan panels along the lower windows; I'll probably use one long rod and then have panels for each window. Not sure on fabric, etc. yet. As for the upper windows, I need to put some UV film on them (the windows are east-facing so the sun in the morning in killer). Megan: My plan for the niches is to have built-ins put in with lower cabinets and open shelving above. In fact, this is the next project on my list for the room! Design Darling: the white side table is from Baker Studio -- isn't it fantastic? Wow! You did a great job. I love the way it looks. The room is coming along beautifully! 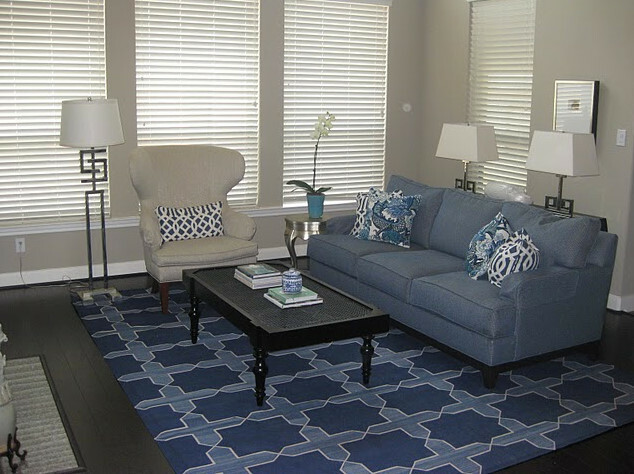 The shades of blue are gorgeous, and I really like that the coffee table is a bit see-through so that the gorgeous rug is visible. Great idea to add a glass top to it. Where's your TV? Do you have it in another room, or in a different corner of this room? I adore your area rug. Gorgeous colors! I've got the Domino book on my coffee table too! Averill, I love what you have accomplished!! Gorgeous combinations! The floor covering, the pillows, the silver Table, Oh my!! You should see the work of art I just created!! Oh and come see my latest work of art.....the colors, I can see in this room!! Oh, it is so fresh and hip! Wonderful job. The wallpaper is divine...is it going in the niches? It looks great. Is this your living room or your family room? In November you were calling it your living room, I think. Have you thought of silk panels for curtains? I am truly amazed at the beautiful designs you have created for your home! There is definitely a trend I have observed - there are many great self-taught designers who have a legal background. Looks so good. I love the mix of reflective surfaces, graphic prints and florals. Wow, wow, wow!!!! I am loving this, Averill. The coffee table is perfect. And, I would love to know more about that wingback. Did I miss this in an earlier post? It might be my favorite piece in the room. LOVE the coffee table! It's very similar to something I'm hoping to find for a semi-formal living room redo I'm helping with. In fact, if it were more square shaped, I'd be ordering it! Great job with your room, and can't wait to see what you whip up with the wallpaper! Wow, your living room looks lovely! Well done and thanks for sharing. Very inspiring! It really looks great! I love the coffee table, good choice! And the pillows are fab!! I know you are so proud!